Hi there, received my Peggy 2 kit yesterday and I've got it all put together, unfortunately it's not all lighting up for me. Here's a photo of the current condition: http://i.imgur.com/IZbVqDm.jpg ; Any suggestions? 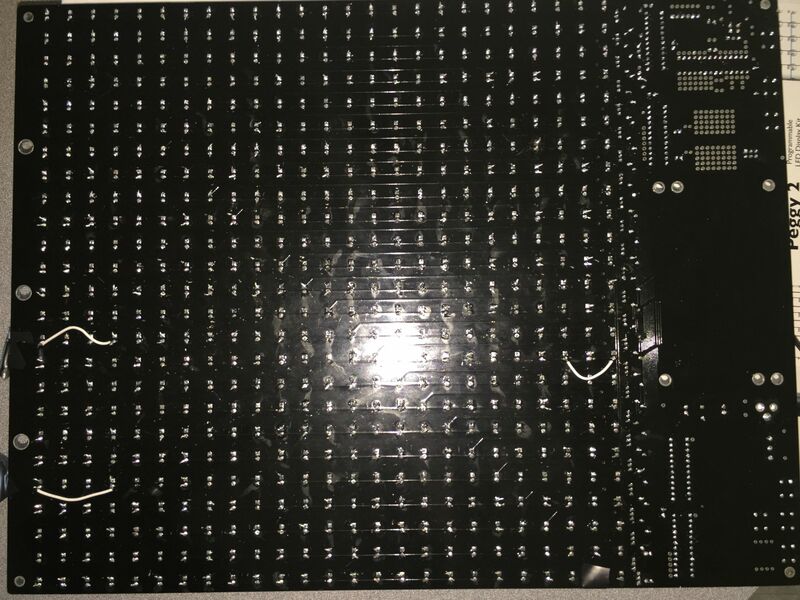 For the isolated LED, check the soldering-- most likely issue. Could also be backwards or damaged-- may need to be replaced. For the colums out, there appears to be a break or scratch in the vertical wire (trace) on the back side of the pcb. You may be able to see the scratch, but in any case you can repair it by adding an extra wire (e.g., a wire lead from a resistor) across the break or between the two LED leads that are supposed to be connected. The LEDs are almost never actually "bad" -- in a bag of 1000, I would expect to find zero duds. However, they can be damaged in the installation process, either in the stage of bending out the leads (most likely situation in this case) or during soldering. That's one of the reasons that we include a few extra in the standard LED packs for Peggy. Perfect. You might want to add a drop of hot glue in the middle of each jumper wire, to prevent the wires from getting eventually broken off. That's a great suggestion. Much appreciated.